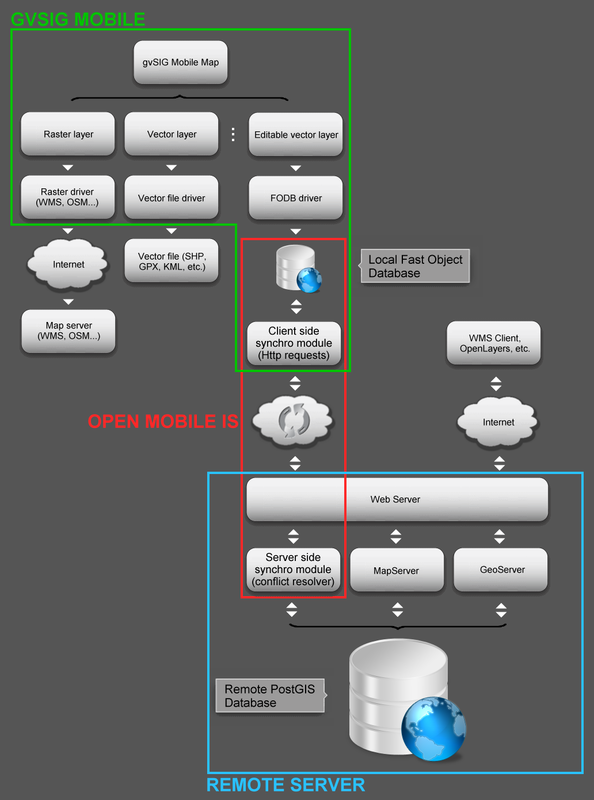 Open mobile IS (aka Openmis) is a Java open source project (GNU LGPL license) that aims to provide all the necessary tools, API and documents effectively enabling the development of mobile applications – not intended especially for GIS applications. It was created by Philippe Delrieu (Ubikis technical leader, based in Lyon, France) and has been used successfully for almost ten years in CDC and CLDC platforms. It’s listed as a mature project in the OW2 (ObjectWeb) consortium forge. Openmis provides the synchronization engine, user authentication and encryption (this is only a part of all the components available in the Openmis framework). Synchronization happens at client request. The client side FODB (fast object database) lets the user work in disconnected mode, while the conflict resolver in the server side will decide who ‘wins’ if both sides have updated the same feature since the previous synchronization. You can see a first test on a PC here. « How far is my boat from the shoreline?